Saturday night I went to the Gypsy Lounge in NW Portland with Michael and Jeremy to watch the UFC show. I’m a fan of Anderson Silva and he was fighting. I ordered a diet coke and skipped the beer. I just didn’t think my stomach could handle it. We ordered a bunch of appetizers for dinner and splitting them between the three of us meant there wasn’t a chance of over-eating. Now I love greasy bar food as much as the next person, but this place had nasty food! 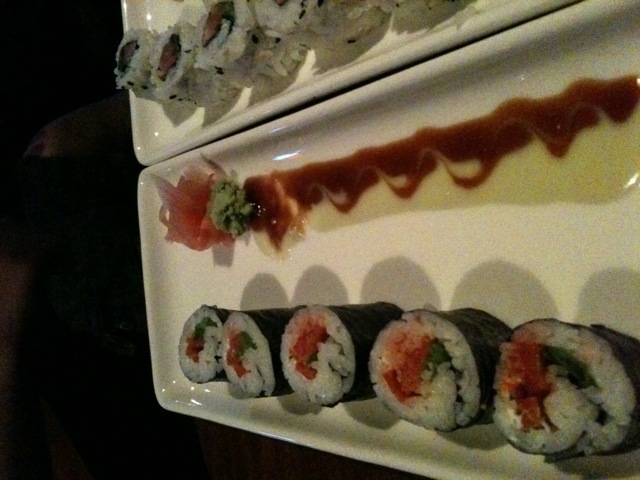 First, Michael and I got some sushi: a Spicy Tuna Roll and a Philly. I didn’t try any of the Spicy Tuna Roll. 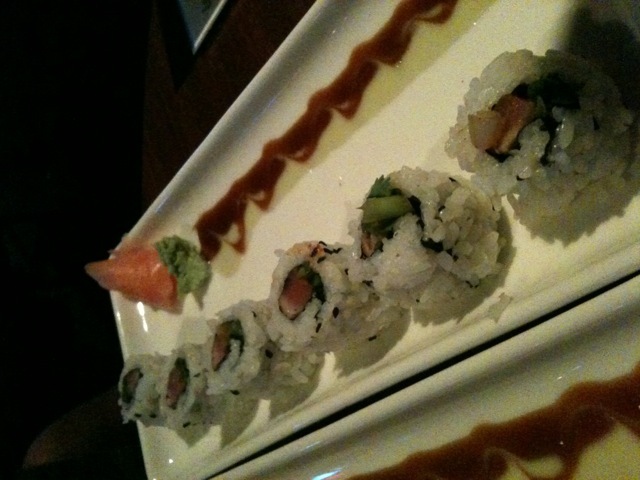 I thought the seaweed would be too chewy for me to eat still. Michael said it was pretty good. I stuck with the Philly Roll. Everything else we ordered was icky in my opinion. The first set of Sliders we got were okay. They were a tad overcooked and lacked flavor but they were alright. 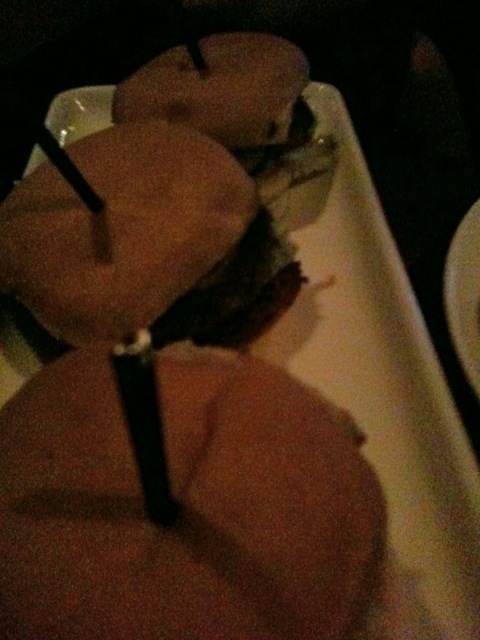 The second set of Sliders were undercooked and I had two bites and gave up. The mozzarella sticks (the picture was too dark) were flavorless. The spicy chicken and bean quesadilla was pretty good. I was disappointed with the food. I had high hopes that we’d have some yummy, greasy bar food. Not so much. I guess it turned out to be a good thing because I ate 1 slider, 2 mozzarella sticks, 3 sushi rolls, and 1 quesadilla slice. I do not feel bad about my calories for the evening! This morning Michael got up early and drove Jeremy to the airport. He’s flying home to Ireland until he returns again in October. I slept in and then went to the pool. It helped me get back into the groove of things. And sitting in the hot tub felt good after yesterday’s long run! I happen to love that website. It’s pretty funny (and equal parts disgusting) to see some of the food showcased on the site. Well Michael and I went to Chevy’s for an improper lunch date on Sunday. I thought I was being healthy ordering a salad. 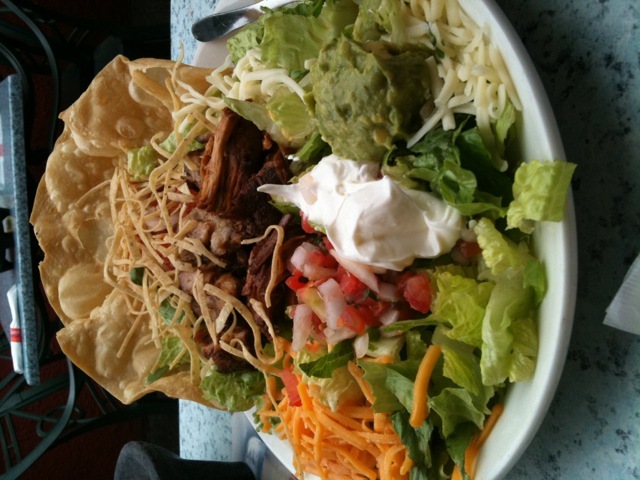 I got the Tostada salad with carnitas and the salsa vinaigrette dressing. When the plate came to the table I almost fell over in shock! Yes the salad is bigger than the plate! Oh my god! I just kept thinking “This is why you’re fat”! It’s just like the website! Salad usually doesn’t keep very well. If it’s still okay tomorrow I’ll eat the rest of it for lunch. 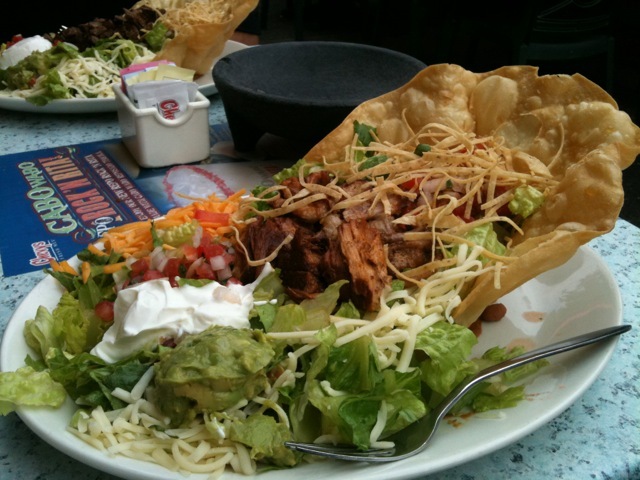 I left the taco shell at the restaurant–definitely don’t need that! 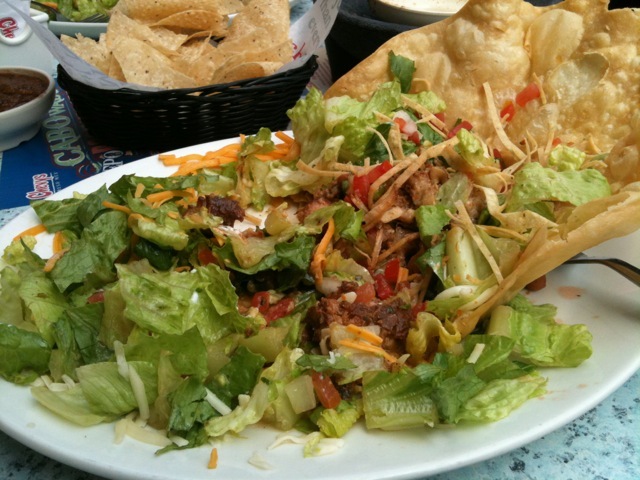 I am still shaking my head at how humongous that salad was. Tonight’s agenda: First Hood to Coast Meeting! QUESTION: What is a bar food that you have a hard time resisting? Have you ever tried to make it yourself but make it healthier? OMG on that salad. And what really scares me is how many of those types of things I ate (finished) before starting a life of disciplined eating. I love quesadillas! And you really can make them healthier, yet still tasty, with some smart substitutions at home. Alan, me too. In “the old days” I would have eaten the whole salad. Quesadillas are easy to make healthy, too. oooh I love nachos – and try to make them healthier at home by adding lots of beans / veggies and using natural yoghurt! I love bar foods. My favorite of all time is probably nachos (like Lisa) and I do make them at home from time to time, but I also love spinach and artichoke dip which I’ve never tried healthifying. Hey! Fellow Portlander! I was just telling my boyfriend last night that I should make another website just about Portland Restaurants and which ones have bad service. 😉 I like McMenamin’s a lot and yes, dressing on the side is a good trick. I usually never use all of the dressing when I do that.